Fashion is a tough industry to get one’s thumb on. It changes with the winds and we’ll never know what trends are going to make the decade famous. The vote is looking pretty unlikely for tin foil hats but not much better for floral-patterned Crocs or shoulder padded velour tracksuits. While it is true that some of our most notorious of fashion trends have vanished to time, others stay in our minds like fond dreams, especially those that were birthed straight out of some of the most infamous fiction in history. Look back to the Roaring ‘20s and channel some of the classiest of all appearances and you’ll not only be winning fashion contests but easily winning the hearts of modern day flappers, especially that Daisy Buchanan! 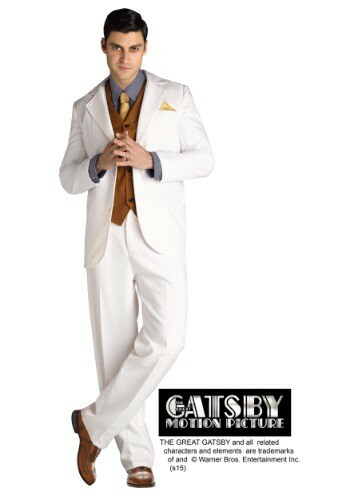 The ladies of the ‘20s demanded certain refinement in their lads and Jay Gatsby was dripping with style. You, too, can give off this elegant air when you transform with this officially licensed Jay Gatsby costume. Don a pure white jacket with narrow lapels and a flashy breast pocket and gleaming front buttons and matching white slacks. Add additional flair to your already worthy look with the cool casual, yet wealthy styling of a front-buttoned vest and crisp cuffed shirt. Be the epitome of style and grace and show history exactly who everyone wishes they could have been by breathing life into fiction as the modern Gatsby.